1. Cook the rice in boiling water for 10-12 minutes until tender then drain. 2. Meanwhile, cook the cauliflower in boiling water for 4-5 minutes, then drain. Cut any large florets into bitesized pieces. 3. 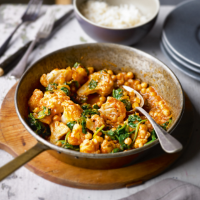 Heat the oil in a large saucepan and fry the onion for 4-5 minutes until golden, add the cauliflower, chick peas and tikka masala sauce and cook gently for 4-5 minutes. Add the spinach and cook for 1 minute until just wilted. 4. Serve with the cooked rice.